Our primary purpose is to improve care and treatment for patients, using data that ultimately belongs to patients. It is perfectly fine and important for all the hospital staff involved in your care to know your personal details. However, once your data leaves the hospital, we have to make sure we safeguard your identity and ensure your details are properly protected. We do that by working with NHS Digital, which is an NHS-approved data ‘safe haven’. They take the data directly from the hospital and extract some of the information to make it ‘pseudonymised’ (almost anonymous) before sending it to the IBD Registry. This means that, by the time your information reaches the IBD Registry, we cannot identify who you are. As part of this process, NHS Digital remove your NHS number and replace it with a unique IBD Registry number. This means the Registry doesn’t know your NHS number and we can’t find it out, but NHS Digital does hold a safety file that keeps track of which IBD Registry number matches which NHS number. In this way, if there is a safety reason or if there is a research project for which you may be eligible, we can ask NHS Digital to get in touch with your doctors. The information held on the Registry will be analysed by clinicians and statisticians who are part of the Registry Team. They will use the data to help us learn more about patterns of IBD care and treatment in the UK. How does the IBD Registry protect my data? Do I have to give my consent now? We hope that you will be asked and that you will also consent. For the time being, in recognition of the practical issues of quickly getting consent from every IBD patient in the UK, the Secretary of State has granted an exemption to allow existing data to be sent to the Registry. That means that, until September 2020, the pseudonymised data can be used without written consent, but doctors and nurses will be asking their IBD patients to give their formal written consent to use their data in the future. We hope that you will recognise the benefits of the Registry and will consent to your pseudonymised data being used. We hope that you will also consent to your data being used for research because that will be of long-term benefit to all patients with IBD. The more data we have for medical research, the greater the benefit to all people with IBD. What if I don’t want my data to be used? Please talk to your IBD doctor or nurse about any concerns you have. The IBD Registry will be most effective if it gathers as much information from as many patients as possible. However, if you decide that you don’t want your data to be used, you have the right to refuse your consent and immediately stop any data about you being used. Please tell your doctor or nurse that you don’t wish your data to be sent to the IBD Registry. Your treatment will not be affected in any way. Can I change my mind at a later date? Crohn’s disease and ulcerative colitis are long-term conditions and so having information about the disease over time will be very useful. The Registry aims to monitor information on as many people with IBD for as long as possible. However, if, in the future, you decide you wish to stop information about your IBD from being sent to the IBD Registry, you should speak to your IBD doctor or nurse, or you can contact the Registry Administrator direct at the address below. Similarly, if you have previously refused consent, but now wish to take part please talk to your IBD doctor or nurse. How can I learn more about the IBD Registry? The best person to talk to is your IBD doctor or nurse. You may also like to see our Transparency Statement and Privacy Statement on our website. Which organisations are involved in the IBD Registry? 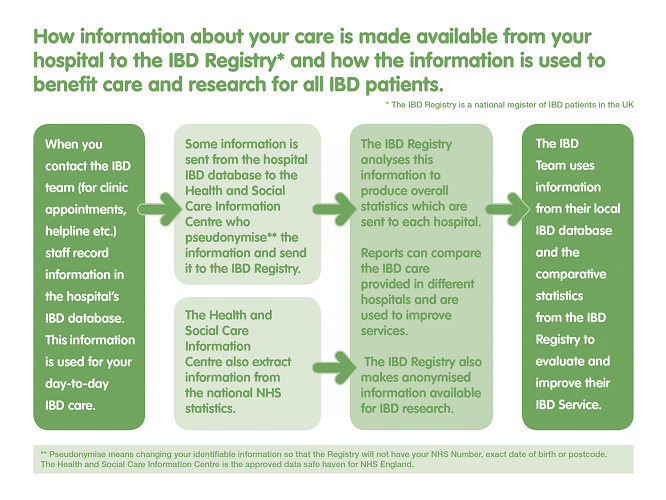 IBD Registry Limited is a not for profit company with three stakeholder organisation: the British Society of Gastroenterology, Crohn’s and Colitis UK and the Royal College of Physicians.